America is below the replacement birthrate. This means that there aren't enough people replacing aging workers that retire to keep economic growth happening. The only way to prevent total economic catastrophe if birthrates stay the same - is a high number of immigrants. "It is already fairly clear that lower birthrates and increased percentages of aged people have begun to slow economic growth in much of the high-income world....[and] The United States’ high projected population growth rate... is entirely dependent upon maintaining high rates of immigration." "A drop in net immigration to the United States is a key factor in the country’s declining population growth rate. Around the turn of the millennium, the Census Bureau was estimating net international migration at about 1.4 million per year." 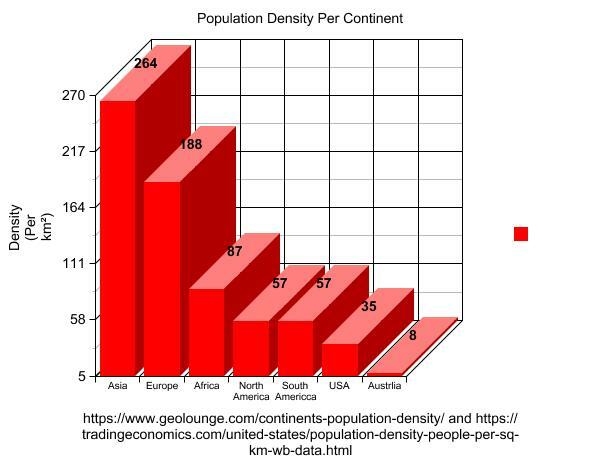 Contrary to popular belief, the United States isn't "full" - North America has one of the lowest population densities out of all the continents in the world, and the United States alone has an even lower population density - about 20% of Europe's density. America could easily fit five times as many people and only be as full as Europe. "The United States is in the midst of an historic collapse in childbearing. Ten years ago, the typical American woman had about 2.1 children. Today, it is about 1.77, representing a collapse in fertility on par with the declines in other countries that yielded Japan’s rapidly graying population in the 1990s, or Canada’s massive present-day demand for immigrants." "In general, growing economies need growing populations, increasing the supply of both workers and consumers"
"Americans in 2008 were radically wealthier and healthier than they were in 1950 — not even though there were twice as many of them but in no small part because there were twice as many of them.... Native birth rates being what they are, this would seem to add up to a case for more immigration."